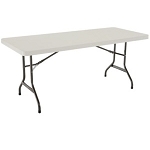 Set up your banquet or meeting hall quickly with this package of 22 Lifetime folding tables. 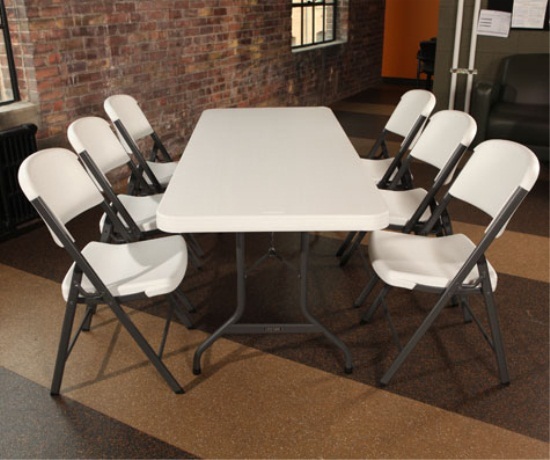 The model 2900 features a a 72 inch long, 30 inch wide high-density polyethylene (HDPE) plastic table top and a sturdy, powder-coated steel frame. The 2900 tables are well-suited for both indoor and outdoors use. Indoors, the feet of the tables have mar-proof caps to protect your floors. Outside, HDPE plastic will not fade, crack, or peel in the sunlight; and, the powder coating on the steel helps the metal resist rusting. These tables are lightweight, weighing about 34 lbs. each, and are easily transported. Depending on your intended use, this package of 22 tables can seat 132 to 176 people. These tables comes with a 10-year factory warranty from Lifetime Products for United States and Canada customers. With a weight-capacity of 2000 lbs. of evenly distributed weight, these tables are also well-suited for more rugged and demanding needs. The Almond color of this table top is a neutral very light-tan, gray color matching most room color schemes. 42900 Lifetime Tables. You can order these tables in 4 packs here. 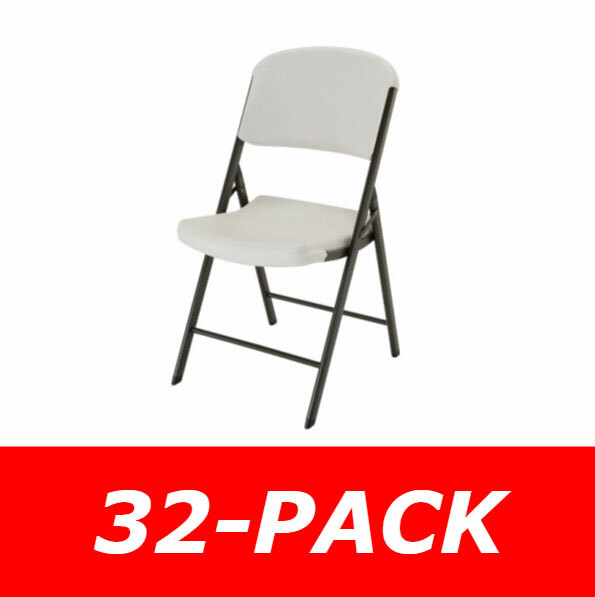 2803 Lifetime Folding Chairs. This is a package of 32 of the matching almond folding chairs. "I did an internet search using Google. We are a small volunteer nonprofit organization that holds charity events for our community development projects such as improvements to our community center (an old gym) such as a roof, a new floor, kitchen area, etc., as well as purchasing Christmas Ornaments for the street lights for the town, Christmas Bulbs for the Town Christmas Tree, Annual Easter Egg Hunt. So, you see, we were looking for the best quality for the least amount we could afford to spend. You fit the bill for us. We will be looking to purchase some chairs in the future and you will be first on our list. 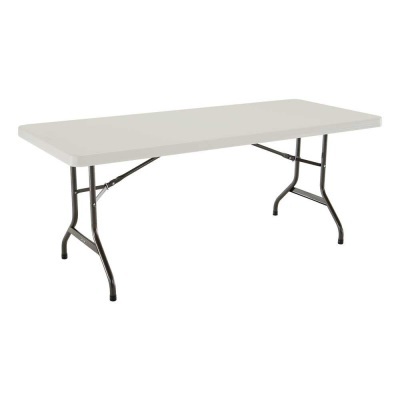 These tables we purchased will be used for wedding receptions, funeral receptions, other organizational get-togethers held at our community site. We will be renting them out for a fee per table to recoup our expenses so that we can continue to raise funds for other events. Thank you so much for your free delivery and shipping that was a good selling point for us." On behalf of the Bucoda Improvement Club. THANK YOU! Shipping dimension: 72.5 inches L x 48.5 inches W x 35.5 inches H.
Shipping weight: about 854 lbs. Ordered Single Pack Version. I found your site by Googling for Lifetime Tables. Q: What does a 4-pack mean? / What is the difference between the 42900 and the 2900? 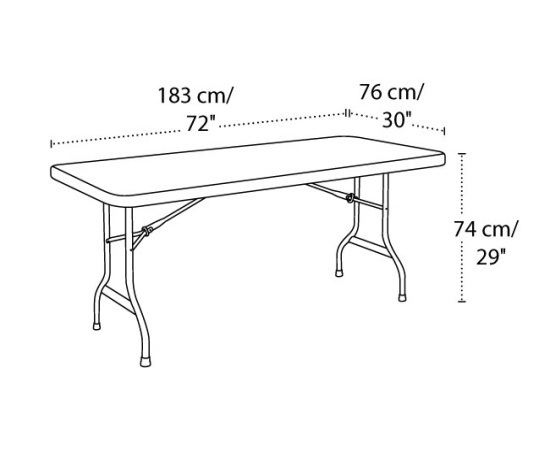 A: The 2900 is a package of 22 of the 22900 folding tables prepackaged together. There is no difference between the 22900 table and the tables in the 2900 package. Q: I want to use this table for my Church/School. Is this table going to hold up? A: When ordered in by itself, a single table will ship via FedEx, which is a doorstep delivery, no signature required. When ordered in larger quantities, this table frequently must ship via an LTL carrier, which requires the customer to be home to sign for the shipment. If your order ships with an LTL carrier, the carrier will schedule an appointment with you before the delivery to make sure someone is home at the time. Q: Do I need a fork lift or dock equipment to receive this order? A: No. If you do not have dock equipment, the pallet with these 22 tables can be unwrapped, and tables removed 1 at a time. 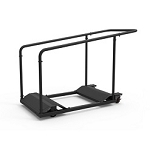 For getting the tables of the truck, most of the trucks we use to ship these tables will include a piece of equipment on the back of the truck called lift gate, which will lower the tables to the ground. If the truck delivering the tables does not have a lift gate, the tables can be removed from the truck 1 at a time. At a weight of about 34 lbs. per table, this is easily handled by most people. Q: What does a "22 Pack" mean? 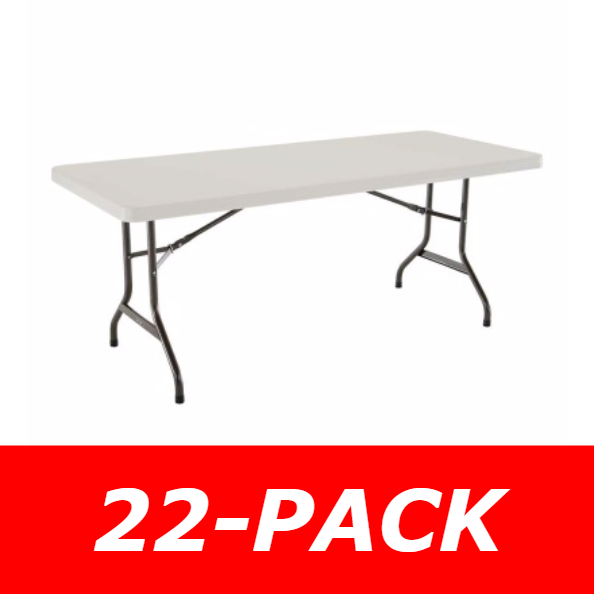 A: A 22 pack means there are 22 tables included in the package. Shipping! Shipments for this 22 pack generally leave the warehouse within 2 business days of ordering. The item ships from the warehouse in Clearfield, Utah via an ltl freight carrier for a curbside delivery. A curbside delivery requires the customer to be home to sign for the shipment and to move the product where needed on the delivery property. For residential deliveries, the delivery company will schedule an appointment for delivery with the customer before attempting to deliver. The customer can also contact the freight company to schedule this appointment. Dimensions: 72" x 48" x 36"